ROXAS CITY, Capiz – Some P19 million worth of various farm implements is set to be given out to qualified farmers’ associations here in the province this 2012. The said machineries are part of the government Farm Mechanization Program through the Department of Agriculture (DA) which mainly aims to increase the production of rice and to keep pace with the rice exporting countries like Thailand and Vietnam. The production and post harvest machinery and equipment include 42 hand tractor, 14 rice thresher, three combine harvester, one rice mill and two units each of four wheel drive tractor and rice transplanter. Capiz provincial agriculturist Sylvia Dela Cruz disclosed that 85% of the equipment cost will be shouldered by DA and the remaining 15 percent will be handled by the provincial government of Capiz. She lauded Gov. Victor A. Tanco for his support and initiative in counter parting for this program to boosts the agriculture sector here. 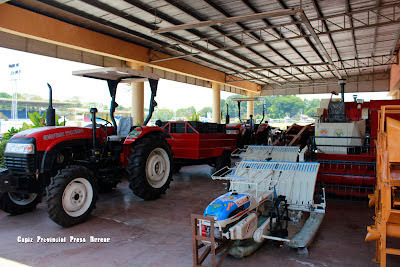 Based on the record of Office of Provincial Agriculturist (OPA), recipients from the 1st district of Capiz will receive 17 hand tractors and six rice threshers, while the 2nd district will get eight rice threshers, two four wheel drive tractors and one rice mill. The remaining three rice combine harvesters and two rice planters are to be handed over by the DA to the provincial government under the supervision of the OPA.